Caring Transitions of Cary serves Cary and the Western Inner Beltline of Raleigh, including the neighborhoods of Five Points, Pullen Park, Prestonwood and the surrounding areas. 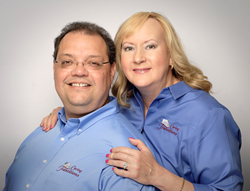 Steve and Tamara Acosta are pleased to announce the launch of their new full-service relocation and transitions company, Caring Transitions of Cary. Caring Transitions’ specially-trained team can handle organizing, packing, de-cluttering, moving, resettling, in-person and online estate sales, liquidations, and preparing homes for market. Caring Transitions specializes in managing senior relocations, but the services are also perfect for busy families and individuals in need of assistance. Caring Transitions of Cary serves Cary and the Western Inner Beltline of Raleigh, including the neighborhoods of Five Points, Pullen Park, Prestonwood and the surrounding areas. Tamara and Steve both understand the challenges of relocating loved ones and then clearing a house when the time comes. Tamara and her three sisters moved their parents into assisted living and then, a year later when they passed away, the family had to clear out the apartment and the house. “We were 2,000 miles away trying to deal with the house and, even with my sisters helping, it was emotional and expensive. Steve stepped into a leadership role to keep us on track and help us make the decisions that needed to be made, but I know we made mistakes. It would have been nice to know about Caring Transitions and to have brought in professionals to help us through that period of our lives,” Tamara said. “Situations like that are just overwhelming. Even if you’re physically able to handle the work on your own, it can make a huge difference to bring in someone who can help you take a step back and manage the process,” Steve added. Tamara has had a varied career – from direct care to social services to pet grooming – but she has always been drawn to work that gets her out in the community. Steve, a U.S. Navy veteran, spent most of his career in the Information Technology industry and found himself ready for a new challenge. He started cataloging not only the things he was good at, but the things that brought him joy and fulfillment.